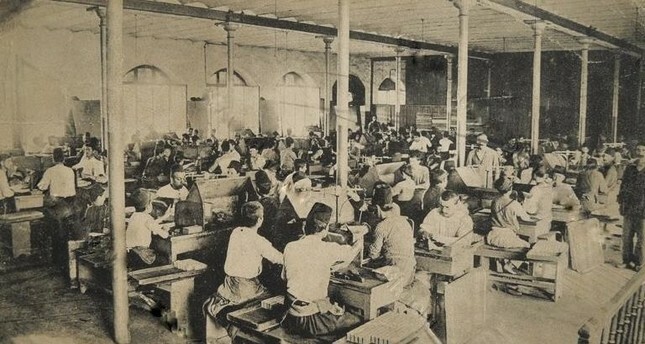 Workers at the Samsun Tobacco Factory in the early 20th century. The emergence of the working class in Europe corresponds to the aftermath of the Industrial Revolution. From then on, slavery, which became to cost much, was abolished and instead, a new class rose. This new class, called the working class, consisted of workers of all ages working for a piece of bread. This unhappy and vengeful society, where people lived in the most unpleasant conditions in the slums in industrial cities, changed the conduct of social and political life in Europe. The rebellions of 1848, which overthrew the kingdom and founded a republic in France, were born from workers' rights movements. Arising under such circumstances, socialism became a nightmare for the world. Capitalist countries, fearing of sinking into this nightmare, gave workers more rights. Hence, the "social state" principle came into being. Since the Ottoman Empire was not an industrial state, the empire was a stranger to working class and labor movements. However, the relationship between employee and employer was founded on strong religious and ethical principles in Islamic-Turkish culture. Islam says that man is in need of each other by nature and he/she cannot make a living purer than what he/she has earned by his/her labor. Prophet Muhammad held the calloused hand of a man who earned his living by digging and said, "This hand does not burn in the fires of hell." A worker is expected to work in an honest way. Prophet Zechariah was a carpenter. One day, as he was having lunch he responded to a greeting later than expected and explained afterwards, "If I responded to your greeting, I would have had to share my food with you. Then, I would not have eaten enough to gather my strength and so I would not have been able to work in the way I promised. This would be a betrayal of my employer." "Your employees are your brothers. Share your food with them and do not assign them more work than they can handle. If the work or assignment is a hard one, help them. Pay them almost immediately after the work is finished. Those of you who do not pay your workers will find me as your enemy on the day of judgment," said Prophet Muhammad. He also praised an ancient man in history whose worker left without getting paid. The employer bought a sheep with the money he owed the man. When the worker returned years later, his employer gave him an entire sheep herd, which was reproduced from that one sheep he had bought with the workers wage. The Quran considers strength and confidence as traits that a worker should have. A Midianite girl recommended Prophet Moses to her father as Moses had these two traits. After serving his father-in-law for 10 years as a housekeeper, Prophet Moses successfully completed his mission, and he married his master's wise girl. That girl is accepted as a rare person in the world with the ability to judge character. The Egyptian woman who wanted to buy Prophet Yusuf (Joseph) in a slave market and Caliph Abu Bakr, who appointed Umar as caliph after himself, are others who are considered as good judges of character. Working hours were based on a specific schedule in the Ottoman Empire. If a shorter shift wasn't specified, workers worked from sunrise to sunset and had breaks for prayer, eating and resting. According to the municipal law of Sultan Bayezid II, workers' wages differed in summer and winter as the day length changes according to the season. The first labor agreement, after the one signed in Britain, was signed in Kütahya in 1766. In this agreement, cup artisans (Kütahya is known for ceramics and related crafts) would be paid in return for a specified amount of cups produced. Ottoman Sultan Süleyman the Magnificent ordered that construction workers at the Süleymaniye Mosque should be paid daily. For this, a "Payment Tent" was put in the middle of the construction area. Afterwards, a fountain, called the "Tent Fountain," was constructed where the tent had been to honor its memory. Financial order in Islam was founded on the basis of social law, which allows room for personal entrepreneurships and enables everyone to earn their living in a legitimate way. Everyone gets paid for work. No one can intervene in income earned in an honest way. There is a right of disposition and property in Islam. The principles of this system are close to those of the liberal economic system, which is practiced in independent countries. However, it is not random liberalism; it is based on free enterprise production and social justice in the distribution of national income among individuals. Adopted as a security valve in the late 19th century by liberal western countries to get rid of the disadvantages of capitalism and eliminate the danger of socialism, union and strike rights and seniority and termination compensation did not keep up with principles specified by Islam's religious law for labor contracts. A labor contract is based on mutual consent and is valid for a specified time. It is also terminated by mutual consent or when the specified time or work comes to an end. The employee cannot demand anything other than the specified payment as the employer cannot demand anything other than the specified service. Issues such as working hours and food given to the employee are also determined according to custom. After the Tanzimat Reform (1839) in which the Ottoman Empire turned to the West for example, the Ottomans faced the first workers' movement as the inevitable result of industrialization. These movements were caused by resistance against mass production. In 1851, weavers, mostly women, attacked the mechanical loom that was installed in Samokovt, Bulgaria, and they retreated when promised the mechanical loom wouldn't be used any more. That was the first workers' movement in Turkey. In 1871, workers' foundations started to be founded in the Ottoman Empire to help needy workers. Workers' strikes started to arise in the empire after 1872. The first one broke out at Tophane (shipyard). Back then, there were about 50,000 workers in Istanbul. However, those strikes were mostly resistance movements caused by nonpayment of charges when due, for example. In 1894, a group of arsenal workers secretly founded a union, "Amele-i Osmani Cemiyeti" (Union of Ottoman Workers); however, it later dissolved. Following the parliamentary monarchy founded in 1908, workers' strikes spread all over the country. In order not to intimidate foreign capital, working hours were regulated in 1909 by law. Workers' unions began to be founded starting in 1912. However, the Young Turks government banned all workers' movements in 1912 under the pretext of the Balkan War. On May 1, 1909, in Thessaloniki, Labor Day was celebrated in the Ottoman Empire for the first time. On May 1, 1921, the Turkish Socialist Party announced a general strike. Trains, tramways and ferries were halted in Istanbul, which was then occupied by Allied forces. A red flag was raised in the main office of the party and the International Socialist Anthem was played all day. Accepted as Labor Day by almost all countries, May 1 dates back to 1856 when Australian stonemasons marched to parliament to demand an eight-hour-shift in Melbourne. Now, May 1 has turned into a show of strength for the socialist movement. After the establishment of the modern-day Republic of Turkey, strikes snowballed due to the harsh economic conditions of the "single party" era. Strikes and workers' movements were banned by the government in 1933, those who broke this law were punished severely, and May 1 celebrations were banned. Once the democratic system began to function in Turkey following the 1950s, workers' rights started to recover.